Which automakers and suppliers are leading the way to autonomy? Rapid advancements in technology have the auto industry on a march toward automated driving. 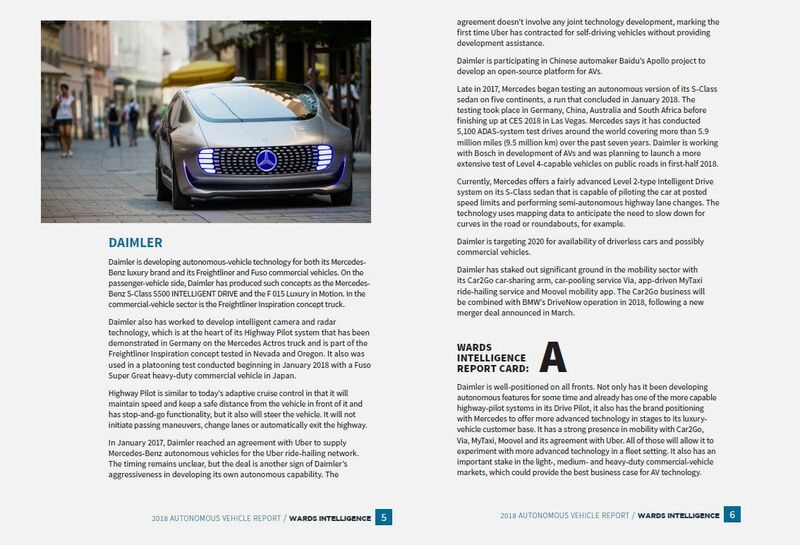 According to the new Wards Intelligence report, The Autonomous Vehicle Roadmap, it’s being made possible by breakthroughs in sophisticated radar, vision and lidar sensors; the expanding capacity and capability of microcontrollers; faster-responding actuators and controllers; and the promise of machine learning via complex, artificial-intelligence driven software. This new report may be ordered now and you’ll receive the PDF document immediately. ORDER NOW. The Autonomous Vehicle Roadmap includes the WardsAuto Intelligence strategic report card, handicapping OEMs’ and suppliers’ strategic preparedness for rapid growth in the AV market. WardsAuto Intelligence’s unique assessment of automaker AV preparedness you won’t find in any other resource. NOW AVAILABLE – ORDER NOW! Technology breakthroughs, market assessments and Wards Intelligence Strategic Report Cards for leading automakers and suppliers. 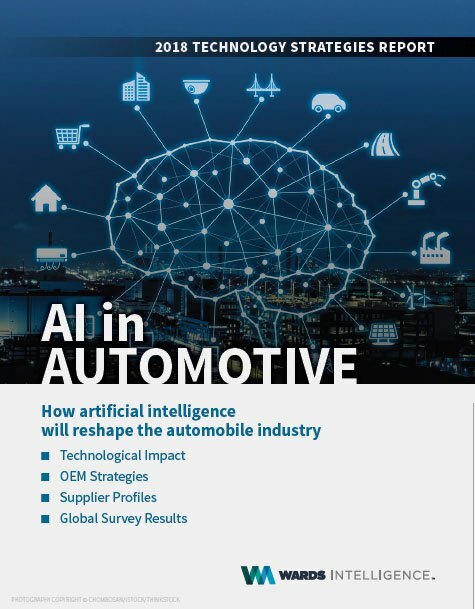 How will new AI implementations change the automotive landscape, with detailed analysis of which automakers and suppliers are leading the AI charge. Contact LWilliamson@WardsAuto.com or 248-799-2642 to learn more.